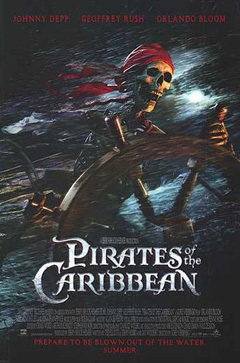 Set in the Caribbean Sea in the 17th century, this is the story of a gentleman rogue of a pirate, Jack Sparrow, who teams up with the daughter of a governor to stop the evil plan of a ship of dangerous pirates who are trying to reverse an ancient curse that leaves them stuck between life and death, with the light of the moon revealing their skeletons, like some kind of undead monsters. This should be renamed the British Pirates given the virtually all-Brit crew on board. Clearly vying with the other Brit crewed sailing epic out this year (Master & Commander) for the Hello Sailor award. This being Disney, it's bound to be historically accurate.